The Wolves V The Bulldogs, the game was made for clichés, “It was a dog fight”, “battle of the bark” or “Clash of the Canines”, but there was only one cliché that stood truest among all the rest – Defensive penalties cost games. This is of course not to take anything away from both teams who, in horrendous conditions went out and true to the games hype and clichés went for the jugular. 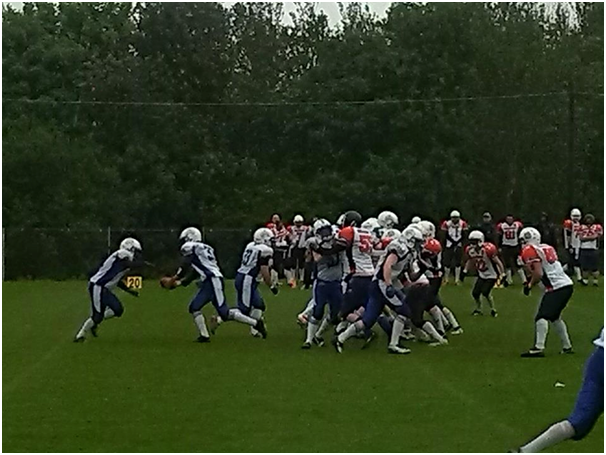 The game began with Waterfords defence taking to the field for the first series of plays; the Bulldogs (after going for it on fourth down) only got the first down due to a defensive penalty. 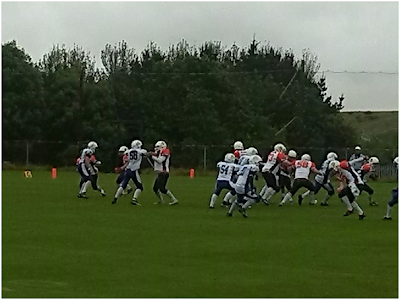 Time for Waterfords newly revitalised offence to take the field against the third best defence in IAFL D1. The offence led by #37 Aaron Walsh started to test the Meath defensive line using their running attacks to pull the defence first left and then right and then right up the middle. But Meath stood firm. This continued for the first quarter with the only notable point being a 15 yard pass from Bulldogs quarterback #7 Eddie McMahon connecting with his receiver. The second quarter began with the Bulldogs fighting hard for yardage, only to be stopped time again by Waterfords defensive line, #56 John McGrath breaking through early on in the quarter to sack McMahon and to force a fumble. The Wolves went four and out though on the next series. 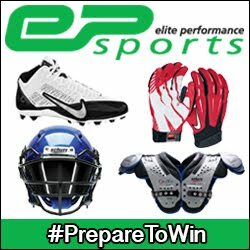 The Bulldogs restarted on the 47yd line, and on second and ten quarterback #7 Eddie McMahon broke loose and ran all the way to the end zone, the two point conversion attempt was unsuccessful though, but, Bulldogs were up by 6. With the conditions worsening both quarterbacks struggled to hold onto the ball from the snaps but to be fair anytime they dropped it they recovered it just as quick. Meath led Waterford into the halftime break 6 to 0. The second half began with a promise made to #52 Sean Fanning to win this game for him as a present for his 21st birthday. The young centre probably never truly realised how much this promise meant to his brothers in arms. But to the Wolves it was a promise they could not break. He was soon to realise though what it did mean. Halfway through the quarter Wolves half back #21 Kevin Butler broke free after some brilliant blocking up front by his offensive line to take the ball 47 yards all the way down to the two yard line. On the third down after an offensive penalty, backing the Wolves up to the 7yard line, #37 Walsh, faked a handoff to the running back before wheeling out to the right on a bootleg to take the rock in and tie the game up. 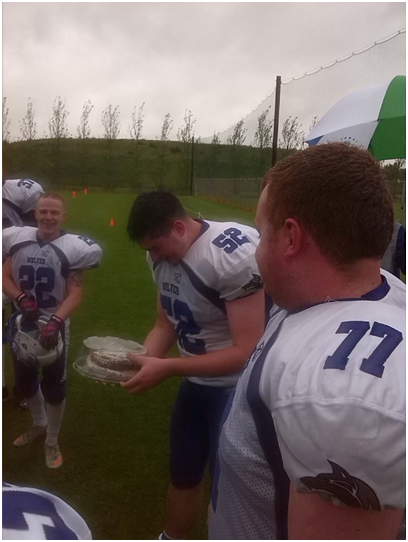 The Bulldogs came out angry but hit a brick wall with the Waterford defence standing tall and stopping them again, #43 Tomas Kirik, a victim of the weather as he nearly had his fourth pick in four games but the wet conditions caused the ball to slip through his grasp on the third down play. As the third quarter neared an end #37Walsh started a drive deep in his own half and marched the Wolves down the pitch, the constant pounding from the running backs #21 Kevin Butler, #22Ger O’Keeffe and #25 Brian Sullivan started to take its toll on the defensive line of the Bulldogs, as the Wolves reached the Meath red zone at the end of the quarter. The fourth quarter of the game started with the game tied at six a piece, but not for long, #22 Ger O’Keeffe went straight up the middle through the heart of Meaths defensive line on second and 2 to take the Wolves into a 12 – 6 lead. Surely the Wolves were now home and free, the offense was working well and there was no way through the defence. But as is typical in this game the Bulldogs had other ideas. #26 Pete McMahon, brother of quarterback Eddie, who was a constant threat all day long proved why he is one of the best running backs in the league, breaking tackles time and again and even crossing the halfway line with two Wolves dragging him back. The very next play saw #26 McMahon split the defence in two, only to be stopped by a brilliant last ditch tackle from #6 Eoin Reinheardt, the Wolves usual quarterback had secured a couple hours off work to stand by his brothers and although he couldn’t start in his usual position, he filled in very competently at SS beside his brother FS #26 Cian. The Bulldogs offence had found some momentum. The two McMahons were moving the chains down the field and on a great running play #26 Pete McMahon must have thought he was in for the touchdown, but for a last ditch tackle from OLB #72 Micheál Ó Coinn that took out McMahon, half the chain gang and indeed the marker itself. These heroics though couldn’t stop the Bulldogs from levelling the game through a quarterback sneak from #7 Eddie McMahon. After the two point conversion failed due to a brilliant tackle #25 Brian Sullivan, now playing on the defensive side of the ball, the Wolves offense took to the field again. The offensive line led by birthday boy #52 Fanning created chance after chance for the running game to push the Bulldog defence back, but as it started to stall on third down, #22 Ger O’Keeffe broke to the outside only to be brought down by his face mask by a Bulldog, then after the play was over was hit late. This is not to say by any stretch of the imagination that Meath were a dirty team, the play itself only lasted a couple of seconds, the incidents in question happened within milliseconds of each other, but this double penalty on the defence cost the Bulldogs thirty yards of field position and pinned them deep in their own half as the ref called the two minute warning. The Wolves remained on offense with 34 seconds left on the clock when #37 Walsh again ran a bootleg play from the thirty yard line, into the end zone only to be brought back to the five after stepping out of bounds. The Bulldog defence fought hard but a gruelling game and cruel conditions were after taking their toll and Walsh took the ball into the end zone for the second time with only 24 seconds left on the clock, to send the crowd of over a hundred soaked Deise folk into pure nirvana. But Walsh wasn’t finished yet, repeating the touchdown play cheekily to take the ball back in for the two point conversion. The Wolves saw out the remaining seconds easily and as the full time whistle blew, the emotion of the day over flowed, they had fulfilled their promise to their brother and had beaten some of the stiffest opposition in the league on his 21st birthday but also they had now regained the No.1 spot in the IAFL D1 and had done it as a team. This in my mind was probably the best Wolves performance I have seen to date in their short lifetime, with both offence & defence playing out of their skin. Ultimately it was quarterback #37 Aaron Walsh that led the offence down the field to get the game winning points but without the massive influence of the offensive line in front of him, the hard running by all of the Waterford running backs, to wear down the defence, the touchdown saving tackles by the defence, the constant pressure put on the Bulldogs quarterback by the defensive line, the fact that the Waterford defence shut down one of the best running backs in the country, and the fact that the Wolves offence beat down the third best defence in the league, all his efforts would have been for naught. But no matter how much you can talk about the team, in every Wolves mind there was only ever going to be one MVP today, Centre #52 Sean Fanning. Next for the Wolves is an away trip to the Mullingar Minotaurs in four weeks’ time. With the Wolves now leading IAFL D1, and riding the crest of a wave with their 4 and 1 record, doesn’t mean they will be complacent. These guys are fired up now; head coach Steve Collins embodied this today as he fired his team up before the start, Who Are We? Wolves came the reply, Who Are We? He raised his voice ….. Wolves came the answer; again he raised his voice roaring WHO ARE WE? WOLVES roared his team.